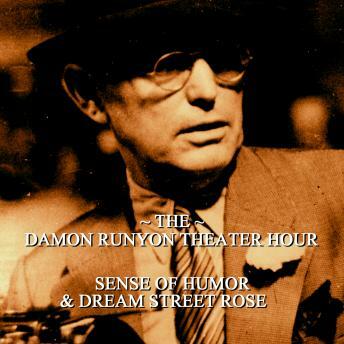 The Damon Runyon Theatre Hour. Damon Runyon is acknowledged as one of the great writers to come out of twentieth century America. Runyon's short stories are almost always told in the first person by a narrator who is never named, and whose role is unclear; he knows many gangsters and has no job that can be gleaned from his musings, nor does he admit to any criminal involvement; He's a bystander, an observer, an average street-corner Joe. Runyon described himself as "being known to one and all as a guy who is just around". That line seems to say a lot about Runyon and his life. It was like you were with him on some street corner hustle or some shady dive and he was filling you in on all the angles, all the gossip, all of life. He was who so many people wanted to be with......or so many people wanted to be. Of course, the cliché about newspapermen and writers is that they are heavy drinkers, chain-smokers, gamblers and obsessively chase women with a sideline in the gathering of stories and facts and actually getting something written just before the deadline hits. That seems like Damon Runyon and his life summed up in one sentence. His stories became legendary ways of looking that bit differently at America, of soaking up the atmosphere of a glamorous and rip-roaring age and distilling it into black and white type or, in our case, The Damon Runyon Theatre Hour.